This article contains Linear A Unicode characters. Without proper rendering support, you may see question marks, boxes, or other symbols instead of Linear A. 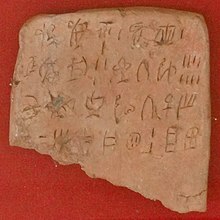 Linear A has hundreds of signs, believed to represent syllabic, ideographic, and semantic values in a manner similar to Linear B. While many of those assumed to be syllabic signs are similar to ones in Linear B, approximately 80% of Linear A's logograms are unique; the difference in sound values between Linear A and Linear B signs ranges from 9% to 13%. It primarily appears in the left-to-right direction, but occasionally appears as a right-to-left or boustrophedon script. An interesting feature is that of how numbers are recorded in the script. The highest number that has been recorded is 3000, but there are special symbols to indicate fractions and weights. Linear A: signary and numbering according to E. Bennett. Reading of signs is based on Linear B analogs. Linear A has been unearthed chiefly on Crete, but also at other sites in Greece, as well as Turkey and Israel. The extant corpus, comprising some 1,427 specimens totalling 7,362 to 7,396 signs, if scaled to standard type, would fit easily on two sheets of paper. Haghia Triadha in the Mesara with 147 tablets; Zakro/Zakros, a port town in the far east of the island with 31 tablets; and Khania/Chania, a port town in the northwest of the island with 94 tablets. Until 1973, only one Linear A tablet was known to have been found outside Crete (on Kea). Since then, other locations have yielded inscriptions. According to Margalit Finkelberg, most—if not all—inscriptions found outside Crete were made locally. This is indicated by such factors as the composition of the material on which the inscriptions were made. Also, close analysis of the inscriptions found outside Crete indicates the use of a script that is somewhere in between Linear A and Linear B, combining elements from both. Archaeologist Arthur Evans named the script "Linear" because its characters consisted simply of lines inscribed in clay, in contrast to the more pictographic characters in Cretan hieroglyphs that were used during the same period. Several tablets inscribed in signs similar to Linear A were found in the Troad in northwestern Anatolia. While their status is disputed, they may be imports, as there is no evidence of Minoan presence in the Troad. Classification of these signs as a unique Trojan script (proposed by contemporary Russian linguist Nikolai Kazansky) is not accepted by other linguists. Since the late 1950s, some scholars have suggested that the Linear A language could be an Anatolian language. There is no remarkable resemblance between Minoan and Hitto-Luwian morphology. None of the existing theories of the origin of Hitto-Luwian peoples and their migration to Anatolia (either from the Balkans or from the Caucasus) are related to Crete. There was a lack of direct contact between Hitto-Luwians and Minoan Crete; the latter was never mentioned in Hitto-Luwian inscriptions. Small states located along the western coast of ancient Asia Minor were natural barriers between Hitto-Luwians and Minoan Crete. Obvious[how?] anthropological differences between Hitto-Luwians and the Minoans may be considered as another indirect testimony against this hypothesis. There are recent works focused on the Luwian connection, not in terms of the Minoan language being Anatolian, but rather in terms of possible borrowings from Luwian, including the origin of the writing system itself. In an article from 2001, Professor of Classics (Emerita) at Tel Aviv University, Margalit Finkelberg, demonstrated a "high degree of correspondence between the phonological and morphological system of Minoan and that of Lycian" and proposed that "the language of Linear A is either the direct ancestor of Lycian or a closely related idiom." In 2001, the journal Ugarit-Forschungen published the article "The First Inscription in Punic — Vowel Differences in Linear A and B" by Jan Best, claiming to demonstrate how and why Linear A notates an archaic form of Phoenician. This was a continuation of attempts by Cyrus Gordon in finding connections between Minoan and West Semitic languages. Another recent interpretation, based on the frequencies of the syllabic signs and on complete palaeographic comparative studies, suggests that the Minoan Linear A language belongs to the Indo-Iranian family of Indo-European languages. Studies by Hubert La Marle include a presentation of the morphology of the language, avoid the complete identification of phonetic values between Linear A and B, and also avoid comparing Linear A with Cretan Hieroglyphs. La Marle uses the frequency counts to identify the type of syllables written in Linear A, and takes into account the problem of loanwords in the vocabulary. However, the La Marle interpretation of Linear A has been rejected by John Younger of Kansas University showing that La Marle has invented erroneous and arbitrary new transcriptions based on resemblances with many different script systems at will (as Phoenician, Hieroglyphic Egyptian, Hieroglyphic Hittite, Ethiopian, Cypro-Minoan, etc. ), ignoring established evidence and internal analysis, while for some words he proposes religious meanings inventing names of gods and rites. La Marle rebutted in "An answer to John G. Younger's remarks on Linear A" in 2010. Italian scholar Giulio M. Facchetti attempted to link Linear A to the Tyrrhenian language family comprising Etruscan, Rhaetic, and Lemnian. This family is reasoned to be a pre-Indo-European Mediterranean substratum of the 2nd millennium BC, sometimes referred to as Pre-Greek. Facchetti proposed some possible similarities between the Etruscan language and ancient Lemnian, and other Aegean languages like Minoan. Michael Ventris who, along with John Chadwick, successfully deciphered Linear B, also believed in a link between Minoan and Etruscan. The same perspective is supported by S. Yatsemirsky in Russia. Beginning our research with inscriptions in Linear A carved on offering tables found in the many peak sanctuaries on the mountains of Crete, we recognise a clear relationship between Linear A and Sanskrit, the ancient language of India. There is also a connection to Hittite and Armenian. This relationship allows us to place the Minoan language among the so-called Indo-European languages, a vast family that includes modern Greek and the Latin of Ancient Rome. The Minoan and Greek languages are considered to be different branches of Indo-European. The Minoans probably moved from Anatolia to the island of Crete about 10,000 years ago. There were similar population movements to Greece. The relative isolation of the population which settled in Crete resulted in the development of its own language, Minoan, which is considered different to Mycenaean. In the Minoan language (Linear A), there are no purely Greek words, as is the case in Mycenaean Linear B; it contains only words also found in Greek, Sanskrit and Latin, i.e. sharing the same Indo-European origin. In 2016, Peter van Soesbergen published a two-part series Hurrians and Hurrian in Minoan Crete alleging that most of the Linear A inscriptions could be understood as a dialect of Hurrian. Among the equations he makes are Linear A uminasi enasi with Hurrian umminnaši ennaši "of the lands of the gods"; Linear A ataijowaja with the absolutive of Hurrian attaiwwašuuš "our father"; Linear A potokuro, seeming to mean "total," with Hurrian puttukuru, "value again"; Linear A sukiriteia with a nickname for Hurrian Šukri-tešup "blessed Teshub"; api on an entrance to a tomb with Hurrian abi "pit (especially for communicating with the netherworld)"; turusa with Hurrian turu "man"; and dupure with tuppuleš "may (he) be strong." Some researchers suggest that a few words or word elements may be recognized, without (yet) enabling any conclusion about relationship with other languages. In general, they use analogy with Linear B in order to propose phonetic values of the syllabic sounds. John Younger, in particular, thinks that place names usually appear in certain positions in the texts, and notes that the proposed phonetic values often correspond to known place names as given in Linear B texts (and sometimes to modern Greek names). For example, he proposes that three syllables, read as KE-NI-SO, might be the indigenous form of Knossos. Likewise, in Linear A, MA+RU is suggested to mean wool, and to correspond both to a Linear B pictogram with this meaning, and to the classical Greek word μαλλός with the same meaning (in that case a loan word from Minoan). The Linear A alphabet (U+10600–U+1077F) was added to the Unicode Standard in June 2014 with the release of version 7.0. ^ Daniels & Bright 1996, pp. 132. ^ Palaima 1997, pp. 121–188. ^ a b Younger, John (2000). "Linear A Texts in Phonetic Transcription: 7b. The Script". University of Kansas. ^ Packard 1974, Chapter 1: Introduction. ^ Owens 1999, pp. 23–24 (David Packard, in 1974, calculated a sound-value difference of 10.80% ± 1.80%; Yves Duhoux, in 1989, calculated a sound-value difference of 14.34% ± 1.80% and Gareth Owens, in 1996, calculated a sound-value difference of 9–13%). ^ Younger, John (2000). "Linear A Texts in Phonetic Transcription: 5. Basic Statistics". University of Kansas. Younger: "if there are 4002 characters (font Times, pitch 12, no spaces) on an 8 1/2 x 11 inch sheet of paper with 1 inch margins, all extant Linear A would take up 1.84 pages." (14.34 pages for Linear B). ^ Schoep 1999, pp. 201–221. ^ a b c d e f g h i Cacciafoco, Francesco Perono (January 2014). "Linear A and Minoan. The Riddle of Unknown Origins": 3–4. Retrieved 9 July 2017. ^ a b Finkelberg 1998, pp. 265–272. ^ Book review by Daniel J. Pullen (Bryn Mawr Classical Review 2009) of W. D. Taylour, R. Janko, Ayios Stephanos: Excavations at a Bronze Age and Medieval Settlement in Southern Laconia. British School at Athens, 2008. "Its location on the Laconian coast, easily accessible from Kythera, undoubtedly encouraged early contacts with Crete whether directly or indirectly (see the Linear A sign catalogued in chapter 11)." ^ Olivier 1986, pp. 377f. ^ Robinson 2009, p. 54. ^ Younger, John (2000). "Linear A Texts in Phonetic Transcription". University of Kansas. See "1. List of Linked Files" for a comprehensive list of known texts written in Linear A. ^ a b Nagy 1963, p. 210 (Footnote #24). ^ Georgiev 1963, pp. 1–104. ^ Nagy 1963, pp. 181–211. ^ a b Palmer 1958, pp. 75–100. ^ Marangozis, John (2006). An introduction to Minoan Linear A. LINCOM Europa. ^ Finkelberg, Margalit, "The Language of Linear A: Greek, Semitic, or Anatolian? ", in: Drews, Robert (ed. ), Greater Anatolia dnt eh Ind-Hittite Language Family, Journal of Indo-European Studies, Monograph 38, Washington, DC, 2001. ^ Dietrich & Loretz 2001. ^ a b La Marle, Hubert. Linéaire A, la première écriture syllabique de Crète. Paris: Geuthner, 4 Volumes, 1997–1999, 2006; Introduction au linéaire A. Geuthner, Paris, 2002; L'aventure de l'alphabet: les écritures cursives et linéaires du Proche-Orient et de l'Europe du sud-est à l'Âge du Bronze. Paris: Geuthner, 2002; Les racines du crétois ancien et leur morphologie: communication à l'Académie des Inscriptions et Belles Lettres, 2007. ^ Younger, John (2009). "Linear A: Critique of Decipherments by Hubert La Marle and Kjell Aartun". University of Kansas. According to Younger, La Marle "assigns phonetic values to Linear signs based on superficial resemblances to signs in other scripts (the choice of scripts being already prejudiced to include only those from the eastern Mediterranean and northeast Africa), as if 'C looks like O so it must be O.'" ^ La Marle, Hubert (September 2010). "An answer to John G. Younger's remarks on Linear A". Academia.edu. ^ Facchetti & Negri 2003. ^ Chadwick 1967, p. 34: "The basic idea was to find a language which might not be related to Minoan. Ventris' candidate was Etruscan; not a bad guess, because the Etruscans, according to ancient tradition, came from the Aegean to Italy.". ^ Owens 2007, pp. 3–4: "Η έρευνα απέδειξε ότι η μινωική γλώσσα σχετίζεται με την ελληνική περισσότερο από κάθε άλλη ινδοευρωπαϊκή γλώσσα, χωρίς να αποτελεί μια άλλη ελληνική διάλεκτο αλλά ένα χωριστό παρακλάδι της ινδοευρωπαϊκής οικογένειας...υπάρχουν λέξεις που εντοπίζονται και στην ελληνική γλώσσα αλλά και σε άλλες, όπως τη σανσκριτική και τη χεττιτική, τη λατινική, της ίδιας οικογένειας.". ^ Owens 1999, pp. 15–56. ^ "The Language of the Minoans". Crete Gazette. 2006. ^ Younger, John (2000). "Linear A Texts in Phonetic Transcription: 10c. Place Names". University of Kansas. Chadwick, John (1967). The Decipherment of Linear B. Cambridge: Cambridge University Press. ISBN 0-521-39830-4. Daniels, Peter T.; Bright, William (1996). The World's Writing Systems. Oxford: Oxford University Press. ISBN 0-19-507993-0. Dietrich, Manfried; Loretz, Oswald (2001). In Memoriam: Cyrus H. Gordon. Münster: Ugarit-Verlag. ISBN 3-934628-00-1. Facchetti, Giulio M.; Negri, Mario (2003). Creta Minoica: Sulle tracce delle più antiche scritture d'Europa (in Italian). Firenze: L.S. Olschki. ISBN 88-222-5291-8. Finkelberg, Margalit (1998). "Bronze Age Writing: Contacts between East and West". In E. H. Cline and D. Harris-Cline (ed.). The Aegean and the Orient in the Second Millennium. Proceedings of the 50th Anniversary Symposium, Cincinnati, 18–20 April 1997. Liège 1998 (PDF). Aegeum. 18. pp. 265–272. Georgiev, Vladimir I. (1963). "Les deux langues des inscriptions crétoises en linéaire A". Linguistique Balkanique (in French). 7 (1): 1–104. Haarmann, Harald (2008). "The Danube Script and Other Ancient Writing Systems: A Typology of Distinctive Features". The Journal of Archaeomythology. 4 (1): 12–46. Nagy, Gregory (1963). "Greek-Like Elements in Linear A". Greek, Roman, and Byzantine Studies. Harvard University Press (4): 181–211. Olivier, J. P. (1986). "Cretan Writing in the Second Millennium B.C.". World Archaeology. 17 (3): 377–389. doi:10.1080/00438243.1986.9979977. Owens, Gareth (1999). "The Structure of the Minoan Language" (PDF). Journal of Indo-European Studies. 27 (1–2): 15–56. Owens, Gareth Alun (2007). "Η Δομή της Μινωικής Γλώσσας ["The Structure of the Minoan Language"]" (PDF) (in Greek). Heraklion: TEI of Crete –Daidalika. Packard, David W. (1974). Minoan Linear A. Berkeley and Los Angeles: University of California Press. ISBN 0-520-02580-6. Palaima, Thomas G. (1997) . "Cypro-Minoan Scripts: Problems of Historical Context". In Duhoux, Yves; Palaima, Thomas G.; Bennet, John (eds.). Problems in Decipherment. Louvain-La-Neuve: Peeters. pp. 121–188. ISBN 90-6831-177-8. Palmer, Leonard Robert (1958). "Luvian and Linear A". Transactions of the Philological Society. 57 (1): 75–100. doi:10.1111/j.1467-968X.1958.tb01273.x. Robinson, Andrew (2009). Writing and Script: A Very Short Introduction. Oxford: Oxford University Press. ISBN 978-9-40-215757-4.
van Soesbergen, Peter (2016). Minoan Linear A. Volume I, Hurrians and Hurrian in Minoan Crete. Part 1, Text. Amsterdam: Brave New Books. ISBN 978-0-19-956778-2. Yatsemirsky, Sergei A. (2011). Opyt sravnitel'nogo opisaniya minoyskogo, etrusskogo i rodstvennyh im yazykov [Tentative Comparative Description of Minoan, Etruscan and Related Languages] (in Russian). Moscow: Yazyki slavyanskoy kul'tury. ISBN 978-5-9551-0479-9. Best, Jan G. P. (1972). Some Preliminary Remarks on the Decipherment of Linear A. Amsterdam: Hakkert. Montecchi, Barbara (January 2010). "A Classification Proposal of Linear A Tablets from Haghia Triada in Classes and Series". Kadmos. 49 (1): 11–38. doi:10.1515/KADMOS.2010.002. Nagy, Gregory (October 1965). "Observations on the Sign-Grouping and Vocabulary of Linear A". American Journal of Archaeology. 69 (4): 295–330. doi:10.2307/502181. Palmer, Ruth (1995). "Linear A Commodities: A Comparison of Resources" (PDF). Aegeum. 12. Thomas, Helena. Understanding the transition from Linear A to Linear B script. Unpublished PhD dissertation. Supervisor: Professor John Bennet. Thesis (D. Phil.). University of Oxford, 2003. Includes bibliographical references (leaves 311–338). Wikimedia Commons has media related to Linear A. Linear A Texts in Phonetic Transcription by John Younger (Last Update: 20 February 2010).